The following is a taster for the Student Engagers’ Movement event taking place at UCL on Friday 23 May. 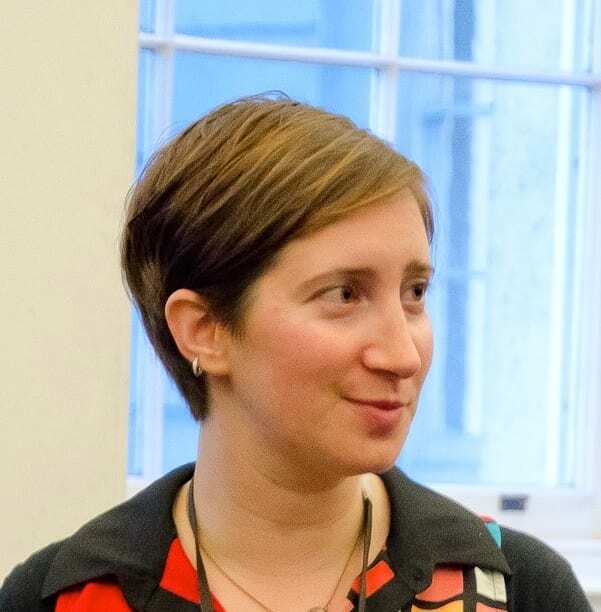 Stacy, a researcher in Archaeology, will be discussing movement through the lens of biomechanics. Imagine you’re in the grocery store. You start in the produce section, taking small steps between items. You hover by the bananas, decide you won’t take them, and walk a few steps further for apples, carrots, and cabbage. You then take a longer walk, carefully avoiding the ice cream on your way to the dairy fridge for some milk. You hover, picking out the semi-skimmed and some yogurt, before taking another long walk to the bakery. This pattern repeats until you’re at the checkout. What you may not realize is that this pattern of stops and starts with long strides in between may be intrinsic to human movement, if not common to many foraging animals. A recent study of the Hadza, a hunting and gathering group in Tanzania, shows that they practice this type of movement known as the Lévy walk (or Lévy flight in birds and bumblebees). It makes sense on a gathering level: you’ve exhausted all your resources in one area, so you move to another locale further afield, then another, before returning to your base. When the Hadza have finished all the resources in an area, they’ll move camp, allowing them to regrow (for us, this is the shelves being restocked). This study links us with the Hadza, and the Hadza with what we can loosely term “ancient humans and their ancestors”. 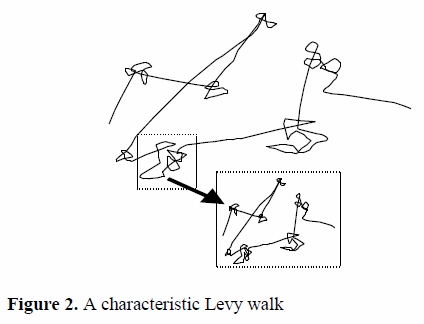 Diagram of a Levy walk. Credit Leif Svalgaard. It’s unsurprising that the Hadza were used to examine the Lévy walk and probabilistic foraging strategies. As they are one of the few remaining hunter-gatherer groups on the planet, they are often used in scientific studies aiming to find out how humans lived, ate, and moved thousands of years ago, before the invention of agriculture. The Hadza have been remarkably amenable to being studied by researchers investigating concepts including female waist-to-hip ratios, the gut microbiome, botanical surveys, and body fat percentage. Tracking their movement around the landscape using GPS units is one of the most ingenious! Much of the theoretical background to my work is based on human movement around the landscape. The more an individual moves, the more his or her leg bones will adapt to that type of movement. Thus it is important to examine how much movement cultures practicing different subsistence strategies perform. The oft-cited hypothesis is that hunter-gatherers perform the most walking or running activity, and the transition to agriculture decreased movement. An implicit assumption in this is that males, no matter the society, always performed more work requiring mobility than females. This has been upheld in a number of archaeological studies: between the Italian Late Upper Paleolithic and the Italian Neolithic, individuals’ overall femoral strength decreased, but the males decreased more; over the course of the Classical Maya period (350-900 AD), the difference in leg strength between males and females decreased, solely due a reduction in strength of the males. The authors posit that this is due to an economic shift allowing the males to be free from hard physical labour. However, I take issue with the hypothesis that females always performed less work. The prevailing idea of a hunting man settling down to farm work while the gathering woman retains her adherence to household chores and finding local vegetables is not borne out by the Hadza. First, both Hadza men and women gather. Their resources and methods differ – men gather alone and hunt small game while women and children gather in groups – but another GPS study found that Hadza women walk up to 15 km per day on a gathering excursion (men get up to 18 km). 15 km is not exactly sitting around the camp peeling tubers. Another discrepancy from bone research is the effect of testosterone: given similar levels of activity, a man is likely to build more bone than a woman, leading archaeologists to believe he did more work. Finally, hunting for big game – at least for the Hadza – occurs rarely (about once every 30 hunter-days, according to one researcher) and may be of more social significance than biomechanical, and berries gathered account for as many calories as meat; perhaps we should rethink our nomenclature and call pre-agricultural groups gatherer-gatherers or just foragers. For a video of Hadza foraging techniques, click here. For a National Geographic photo article, click here. Marchi, D. 2008. Relationships between lower limb cross-sectional geometry and mobility: the case of a Neolithic sample from Italy. AJPA 137, 188-200. Marlowe, FW. 2010. The Hadza: Hunter-Gatherers of Tanzania. Berkeley: Univ. California Press. O’Connell, J and Hawkes, K. 1998. Grandmothers, gathering, and the evolution of human diets. 14th International Congress of Anthropological and Ethnological Sciences. Raichlen, DA, Gordon, AD, AZP Mabulla, FW Marlowe, and H Pontzer. 2014. Evidence of Lévy walk foraging patterns in human hunter–gatherers. PNAS 111:2, 728-733. Wanner, IS, T Sierra Sosa, KW Alt, and VT Blos. 2007. Lifestyle, occupation, and whole bone morphology of the pre-Hispanic Maya coastal population from Xcambó, Yucatan, Mexico. IJO 17, 253-268.